CHORLEY, a town, a parish, a sub-district, and a district in Lancashire. The town stands on the river Yarrow, the Leeds and Liverpool canal, and the Preston and Bolton railway, 9 miles SSE of Preston. Its site is high ground. Its appearance is that of a seat of cotton manufacture; and its environs abound in gentle eminences, and afford many charming views. The town hall is a neat structure of 1802; and the market house was erected in 1826. St. Lawrence, or the parochial church, is Norman and early English; has a massive pinnacled tower, of the time of Edward VI. ; and includes two aisles of 1862. St. George's church is a structure of 1825, in pointed architecture, with pinnacled tower; and cost £11,845. St. Peter's church was built in 1851. There are two Independent chapels, two Methodist, a Baptist, a Unitarian, and two Roman Catholic; a grammar-school, alms-houses, and other charities, with £129; a dispensary and a workhouse; a head post office, a railway station with telegraph, and three chief inns. A weekly market is held on Tuesday; and fairs on 26 March, 5 May, 20 Aug., 4 Sept., and 21 Oct. The town is a seat of petty sessions and a polling-place; it has eleven cotton factories, two printworks, five weaving-sheds, and extensive bleaching-works; and it carries on much trade in connection with neighbouring mines and quarries. It is regarded as conterminate with the parish. Pop., 15,013. Houses, 2,748. The parish comprises 3,571 acres. Real property, £43,100; of which £1,200 are in gas-works. The property is much subdivided. Astley Hall and Gillibrand Hall are chief residences. Two chapelries, St. George and St. Peter, were constituted, the former in 1835, the latter in 1852. Pop. of St. G., 9,619; of St. P., 2,207. Houses in St. G., 1,731; in St. P., 402. The mother parish, or St. Lawrence, is a rectory, and St. George and St. Peter are vicarages, in the diocese of Manchester. Value of St. Lawrence, £1,022;* of the others, £300* and £200. * patron of St. Lawrence, the Rev. J. S. Master; of the others, the Rector. The sub-district contains also four townships of Standish parish, and one of Leyland. Acres, 10,859. Pop., 18,027. Houses, 3,301. The district comprehends likewise the sub-district of Brindle, containing the parish of Brindle, and three townships of Leyland; the sub-district of Leyland, containing five townships of Leyland parish; the sub-district of Rivington, containing two townships of Bolton-le-Moors parish, and three of Standish; and the sub-district of Croston, containing four townships of Croston parish, and two of Eccleston. Acres, 52, 213. Poor-rates, in 1862, £10,292. Pop. in 1841, 38,836; in 1861, 41,678. Houses, 7,841. Marriages, in 1860, 352; births, 1,437, of which 125 were illegitimate; deaths, 802, of which 350 were at ages under 5 years, and 16 at ages above 85. Marriages in the ten years 1851-60, 2,879; births, 14,342; deaths, 8,575. The places of worship in 1851 were 16 of the Church of England, with 9,851 sittings; 4 of independents, with 1,290 s.; 2 of Baptists, with 150 s.; 2 of Unitarians, with 440 s.; 11 of Wesleyan Methodists, with 2,783 s.; 1 of Primitive Methodists, with 284 s.; 2 of the Wesleyan Association, with 356 s.; and 8 of Roman Catholics, with 3,463 s. The schools were 35 public day schools, with 3,500 scholars; 19 private day schools, with 576 s.; 51 Sunday schools, with 9, 061 s.; and 6 evening schools for adults, with 80 s. There are two workhouses; the one in Chorley, the other in Brindle. Details about the census records, and indexes for Chorley. You can also perform a more selective search for churches in the Chorley area or see them printed on a map. The registers of the parish church, St Laurence have been published by the Lancashire Parish Register Society as follows. Volume 38 - Bap, Mar & Bur 1548-1653. Volume 129 - Bap & Bur 1653-1708, Mar 1654-1708. The Register Office covering the Chorley area is Chorley. Ask for a calculation of the distance from Chorley to another place. "CHORLEY, a parish and market town, in the hundred of Leyland, in the county of Lancaster, 32 miles S.E. of Lancaster, and 208 N.W. of London by road, or 206 by the North-Western and Lancashire and Yorkshire railways, on the latter of which it is a principal station. The town is pleasantly situated on an eminence in the centre of the country, on the great western road from London to the N., near the Leeds and Liverpool canal, which, in conjunction with the Lancashire and Yorkshire railway, affords facilities for the carriage of goods to all parts of the kingdom. The small river Cner falls into the Yarrow about a mile below the town. From the former stream Chorley derives the first syllable of its name, and the last from the family of Loy, its ancient proprietors, who have also given their name to the hundred. In ancient times the town was of small importance, and Leland describes it as a "wonderful poore, or rather no market town;" but of late years it has been fast rising in prosperity, and has more than quadrupled in extent and population during the present century. The town is Lighted with gas, and is well supplied with water, which can be raised to the roofs of the highest buildings. Chorley has some beautiful scenery round it, and in the neighbourhood are several elegant mansions. The chief articles of manufacture are calicoes, muslins, and ginghams. The town contains nine cotton factories, two print-works, two weaving sheds, bleach-works, and a paper-mill, and in the vicinity are found, in large quantities, coal, slate, iron-ore, and millstone, all of which are worked, and afford employment to a great number of the inhabitants. Four miles from the town are several mines of lead-ore and alum-shale, with carbonate of barytes. A new patent brick and drain-tile manufactory has been recently established. The government of the town is vested in a chief constable and visiting magistrates, who hold their weekly meetings in the town hall, a neat stone building, erected in 1802 at the sole expense of the late John Hollinshead, Esq. The under part of the building is open, and is used as a market-house. There are also a dispensary, established in 1828, a savings-bank, and a bath-house attached to the mineral spa, which takes its rise in the vicinity of the town. The living is a rectory in the diocese of Manchester, value £1,022, in the patronage of the Rev. J. 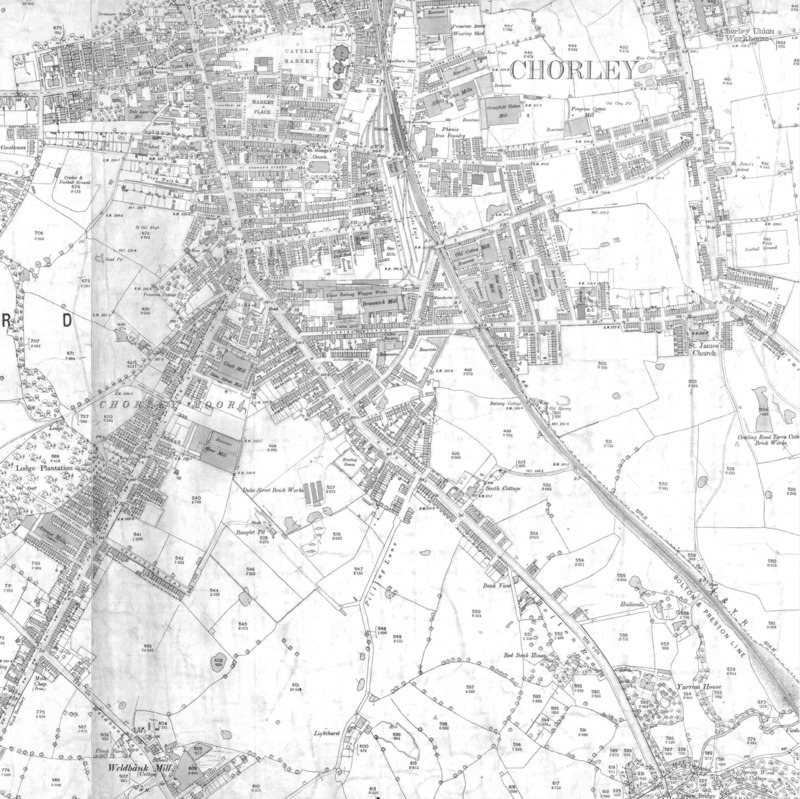 You can see the administrative areas in which Chorley has been placed at times in the past. Select one to see a link to a map of that particular area. View maps of Chorley and places within its boundaries. 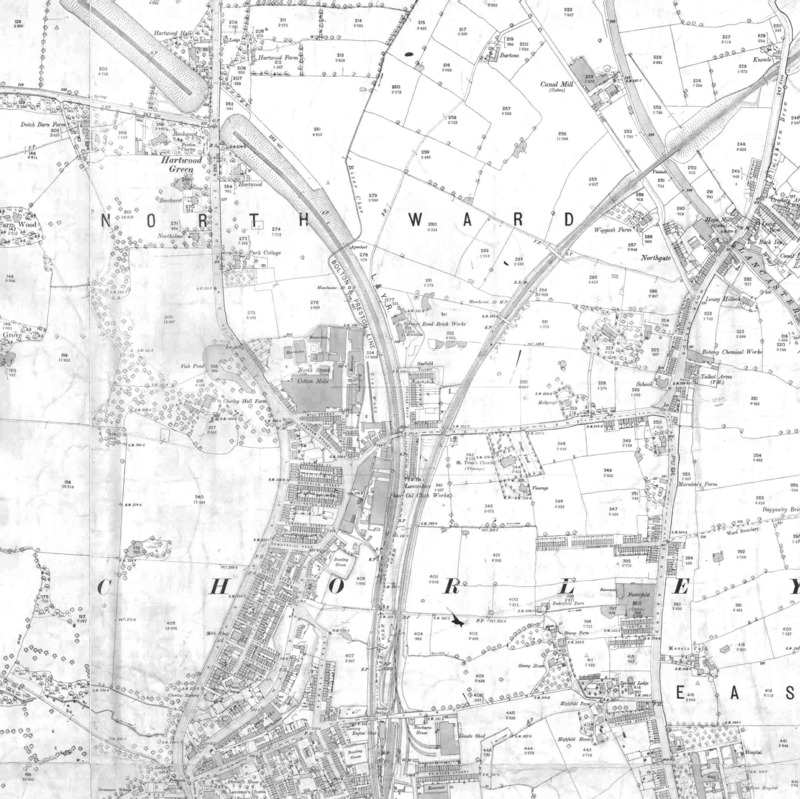 Maps of Chorley North and South around 1890. The Workhouse site has an interesting description of Chorley workhouse. 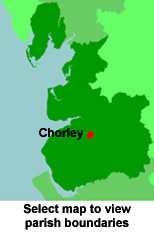 For probate purposes prior to 1858, Chorley was in the Archdeaconry of Chester, in the Diocese of Chester. The original Lancashire wills for the Archdeaconry of Chester are held at the Lancashire Record Office.